Here is a quick overview of the most important parts of a compound microscope (biological microscope) and their function. Base: This is the bottom part of the microscope, it contains the lamp. Coarse Focus: Also referred to as rough focus, this knob raises and lowers the microscope stage quickly. It should only be used in connection with the low magnification lenses. Eyepiece Lens: Also known as ocular lenses, they magnify the image of the objective. The eyepiece is the lens into which a person looks into when observing. The total magnification of a microscope is calculated by multiplying the magnification of the objective by the magnification of the eyepiece. Many eyepiece lenses have a magnification of 10x ot 15x. Fine Focus: This focus knob moves the stage up and down in small steps. It is used to focus at different layers of the specimens. Head: This is the top part of the microscope. It carries the eyepiece(s) and other optical elements. There are several different types of heads: a monocular head is designed to carry only one eyepiece, a binocular head carries two (but does not give stereoscopic vision in compound microscopes) and a trinocular head is designed to carry a camera as well. Mechanical Stage: This type of stage is equipped with a slide holder and two knobs to turn. One knob moves the stage backwards and forwards, the other one moves the slide sideways. Nosepiece (or revolving nosepiece, turret): This part carries the objectives. It can be rotated. Objective Lens: This is a highly magnifying lens system, it is located close to the specimen to be observed. The image of the objective is then magnified again by the ocular lens which is close to the eye. Stage: This is the flat surface on which the slides are placed on. It can be moved up and down for focusing. Stage Clips: These are clips that hold the slide. Trinocular Head: This microscope head has three exits, two for viewing (for binocular vision) and a third exit to connect a camera. 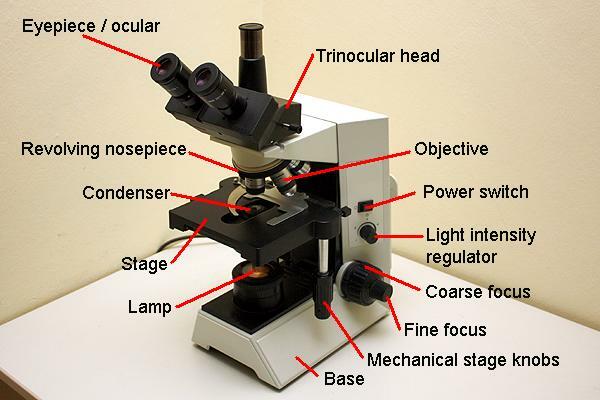 Some microscopes also allow for taking photographs through a special adapter at the eyepiece, but a trinocular head offers more stability and is to be preferred for photographic work. what a nice and precise explanation..thanks ..
there are 2 types of lenses in mirror of the compound microscope. one side is convex and the other side is plane surface of the mirror. The curved mirror bundles the light and this influences both light intensity and resolution. Oliver.